SHOULD I GIVE UP MY DREAM? What’s up, Brandon? I really want to be a photographer when I grow up. But, my friends think it’s weird and I wouldn’t be able to make a living out of it. That makes me question if I should give up on my dream this early. Since you’re a photographer, I thought I should get your side on things. Okay, so the first thing to address is your main question: Should you give up your dreams? Okay, hang on, I’ll back up a little. But just a little. Dude, first of all, you’re what? 12? 13? Even if you’re 16…there’s time! You don’t have to decide what you want to do right now. But if you KNOW you have a passion for photography, then you should be having fun with photography right now, like building skills, trying new things, and learning how to edit stuff. Even if you don’t end up with a career in photography, you’ll have learned a super useful skill you can use in your life. 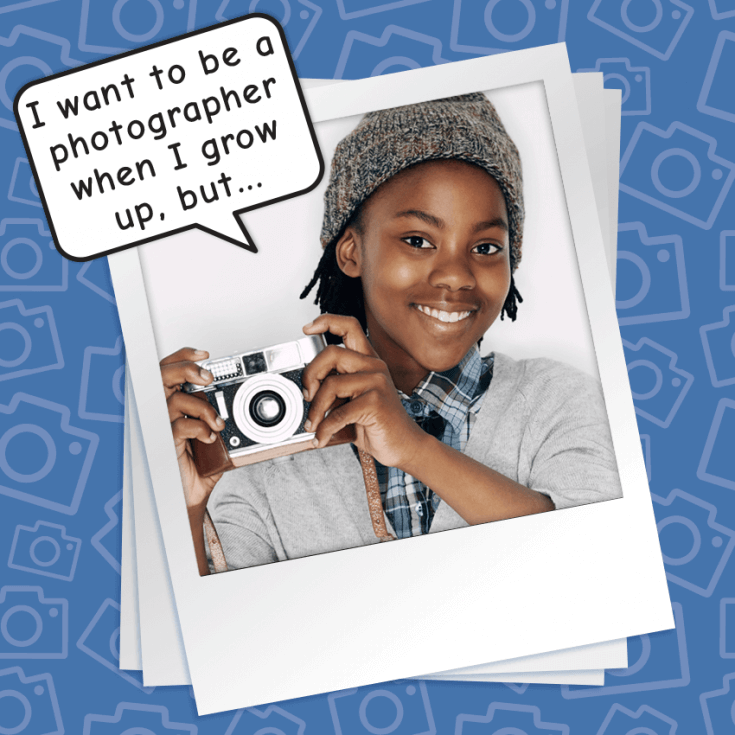 But if you’re still really into photography as an adult, there are lots of career options! Journalism: Photography for newspapers, websites, etc. Photojournalists might cover local, national, or world events, sports, politics, or court proceedings. Commercial photography: Taking photos for companies of products and services, like for advertisements, catalogs, websites, etc. Portrait photography: School/family photos, weddings, graduations, and other special events. Fashion photography: This includes shooting fashion spreads for a magazines and websites, and shooting live fashion shows. Scientific photography: This one’s really cool—these photographers record experiments, illustrate technical information, and use special cameras to photograph microscopic images! Scientific photographers work for government agencies, research facilities or universities. Military photography: You can even make a career as a photographer in the military! Photographers in the U.S. Army take images of Army life and operations, which are used in news stories or press releases. So, there are a lot of great career options. But I don’t think that’s even the important part. The important part is that you keep doing what you enjoy (like photography) and get better at it. And if you keep enjoying it, you can figure out the best way to make it a permanent part of your life, whether it’s your career or not. And this is true for lots of dreams. Not everyone who loves singing is going to become a pop star and win a Grammy. But they can join choirs for fun, rock karaoke, do community theater, or sing with their family and friends. Developing their singing skills when they were younger wasn’t a waste, even if they didn’t end up topping the charts. Same for sports. Not everyone who loves baseball will make the major leagues. They won’t all even be able to play on a college team. But anyone can join a neighborhood softball league, coach Little League or spend weekends at the batting cages. Plus they’ll be having fun and doing what they love. They’ll also get some exercise, too. So no, don’t give up on your dream. Have fun, learn and improve. Then see where it takes you! Do you have a dream your friends or family think is crazy? How does that make you feel? How do you pursue your dream? I smacked his leg because I was sitting down when he asked me. I know I know. But I also have 2 siblings who go there. But they say that he awkward to be with. And I sit next to Jeremy (him) in school! You should find out more about him before you fall in love.